First of all, it must be said that Berkley has some of the most stunning and lovely book covers that the computer screen does not do justice to. When I received this book in the mail I was immediately more interested in it than before because the cover is absolutely enticing, really evoking a sense of mystery. And I was more pulled in when I started reading, because it's set in what is apparently The Gilded Age...a time period I enjoy reading about in New York City. Incognito tells the story of William Dysart, an attorney trapped in a loveless marriage who has no idea how to pull himself out of the miserable life he has created for himself. He is assigned a case where he meets a beautiful woman who he immediately has an interest in. He's curious about her reasons for not wanting to sell her land to a woman powerful enough to chase her off of it anyway. He feels there is more to the story than he is being told. Additionally, he is beginning to remember and uncover things about his own past that are causing him to question his present and future. Incognito is described as a mystery and while there are certainly mysterious elements to the story, I feel it is more accurately described as the journey of one man to transform himself. I couldn't help but be very involved in the story. I felt deeply for William and while his choices at times frustrated me, I understood his motivations. I really liked so many things about the book, for example, the way he at first found Sybil only pretty but as he got to know her he began to wonder how he had never considered her beautiful. I liked that William at times feels downright despair, a fear of being in love having led him to the most miserable of all marriages, and his pursuit for justice. And yet he's almost unwilling to do anything about getting out of it. Because a lot of times when you're down and depressed it's just a lot more comfortable to stay that way. I even liked that the mystery is quite a slow burn because the characterization more important, even though characters like Arabella were quite one dimensional. I especially enjoyed visiting the time period in the book, and seeing William learn a new story to tell himself about his past. 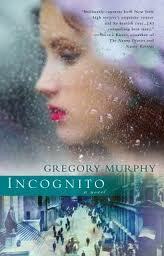 Incognito makes a great afternoon read if you want to visit the lives of the wealthy in New York city in the past, enjoy a little mystery, and at times, some very lovely writing.